About a decade ago when I started my family history research in earnest, I was assisted by an extremely talented genealogist by the name of Karin Corbeil. I was amazed at her generosity and the amount of time and care that she invested in researching my family line. At the time, I couldn't understand why someone would volunteer to research a family that wasn't even their own and ask for nothing in return. That was before I came to know the community of genealogists and witnessed this kind of generosity over and over again. Karin's husband descends from Nancy Purdy (1797-1878) and I descend from Daniel Purdy (1817-1897). Daniel is one of my most recent brickwalls. Karin had long theorized that both Nancy and Daniel were grandchildren of Joseph Purdy (c.1736-1818) whose family is found in 1803 in Haldimand Township, Ontario, Canada. Joseph Purdy was the son of Obadiah Purdy and Phoebe Underhill. If her theory is correct this would make her husband and I sixth cousins. To all of our benefit, Karin has now ventured into the world of genetic genealogy and, with a mind like hers, she is extremely well suited to the endeavor. While scanning her husband's Relative Finder matches on 23andMe.com, she came across an anonymous match with familiar ancestral surnames listed (not Purdy). Due to her extensive work on the Purdy family trees, with only four surnames to go on, Karin was able to make an educated guess as to who the person was behind 23andMe's shield of anonymity! She then asked me if I also had this individual on my list of matches. I didn't, but I did find him in my paternal aunt's and uncle's Relative Finder by searching on one of the listed surnames. Since he hadn't answered her initial invitation through 23andMe, Karin tracked down an email address and sent a message to the suspected person behind the match. Sure enough, she was correct and, even better, he was willing to "share genomes" with both Karin and I to determine more details about our match. Karin's husband and this individual, who are 4th cousins through their Purdy ancestral lines, share .35% of their DNA and were correctly predicted to be 4th cousins by 23andMe. Interestingly, this Purdy Cousin also matches my aunt and uncle, who would be his 5th cousins once removed if Karin's theory is correct, on .14% of their DNA and was predicted to be a 5th cousin. ﻿﻿My sisters and myself, who would be his sixth cousins, do not show a match with him at all on 23andMe. 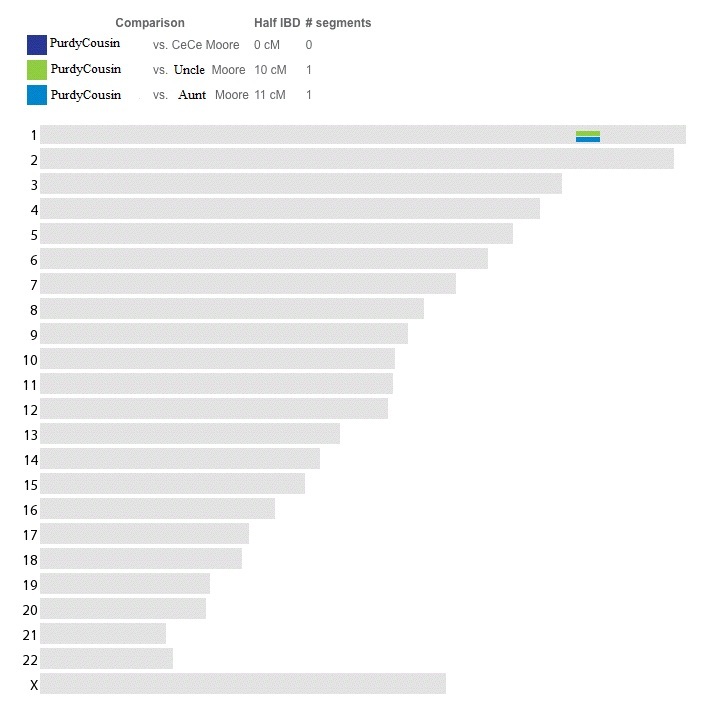 We also investigated our matches on Gedmatch.com to determine if there might be some smaller matches that fell just below 23andMe's matching threshold. Since my father was tested at FTDNA instead of 23andMe, I was also able to compare his DNA to that of our Purdy Cousin using Gedmatch's tools. Many of these segments are too small to be meaningful, especially the matches that I show on Chromosomes #8, 9 and 12 since they are not detected in my father's DNA. However, when looking at this data as a whole, it is apparent that there truly is a familial relationship between these individuals. Although we cannot be absolutely certain that the shared DNA that has been detected between them is from our Purdy ancestral lines, I feel comfortable that this data combined with Karin's many years of solid research shows very strong evidence in support of this conclusion. Karin writes that this is "... a huge breakthrough in the genealogical community for Purdy researchers. For many years now, I and a number of family researchers and historians have been trying to connect Nancy Purdy (wife of Harnden Eddy) to other Purdys in Ontario, Canada." In time and with more Purdy descendants in the database, I believe that we will be able to determine beyond a reasonable doubt if this DNA is indeed inherited from our presumed common ancestor Joseph Purdy. On a side note, I recently discovered that Karin is adopted and searching for her birth family, which is astounding considering her genealogical prowess! She was born as Carol Lee Foley on July 22, 1945 in Brooklyn, New York. If anyone has any information that might help Karin find her birth family, please contact me and I will pass it on to her or visit her new blog. I am quite confident that with her research skills and the newly added valuable tool of DNA to her toolbox, Karin will soon solve this mystery. The family that she finds will be very lucky to have her. I wish her and all adoptees success in their searches. Everyone deserves to know who they are and, in this era of personal genomics, it is finally becoming possible. This is kind of very strange. Two days ago I contacted Karin because I found a match through www.gedmatch.com with my mother's DNA. Even more unusual is that I sent you a message through Facebook, as well as a hotmail address due to a match my mother has with YOU or a family member of yours, using CeCeMoore email address. I do not think you have had the time to digest all of your mail, so please keep an eye out for it! Shucks... I'm down from Joseph Purdy, but the one born in 1653. Too bad. A Framarini - you are exactly right! I am way behind in my correspondence. I promise to answer soon. Marilyn, You are still welcome to participate. You never know what you might find! I have a friend called Nancy Purdy, whose parents are alive and well in Ontario. Let me know if you want me to get in touch with her for you.